GEOCACHING is a real-world outdoor treasure hunting game. Players try to locate hidden containers, called geocaches, using GPS-enabled devices and then share their experiences online. Does it sound a little bit nerdy, but at the same time, a little bit cool? Well, I can assure you it is REALLY nerdy AND REALLY cool...all at the same time! I have been reading up on it for a few weeks now, but last weekend, I took the plunge and went on a search for my first Geocache. So I set the location on my iPhone when we came out of the hundeskov and away we went..... I have to admit it was so exciting to watch the little blue dot get closer and closer to the coordinates of the Geocache we were hunting... and then we went go to the correct coordinates, the real fun began... figuring out WHERE it was hidden! I knew it was in one of "geocache approved/animal-proof/weather-proof" boxes, but it was not in plain sight... EVEN MADS got into the hunt.... but then after a few minutes, VICTORY was ours!! Some caches have things you can take (as well as leave your own contribution) while others are clues to more geocaches...while still others are just simple caches that you find and then log your name as one of the discoverers! My first geocache was the third category--you find it and then log your name in the book amongst all the others who had walked that path before you. 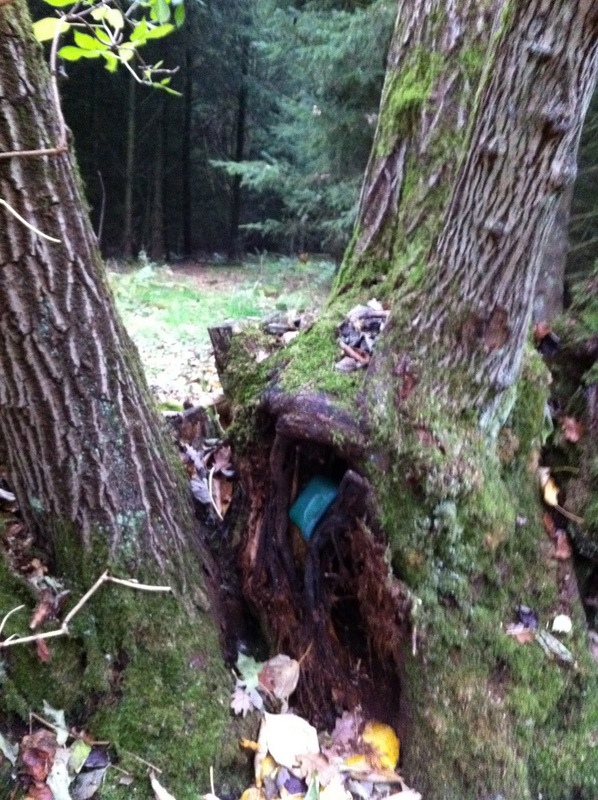 This geocache (#1 På tur i Løvbakkerne)that we found last Sunday has been in place since May of 2009...more than TWO YEARS! And the greatest thing is that it is #1 in a series of 12 other caches.... It is located along a path not too far from our favorite hundeskov, but it is on a path that we HAVE NEVER BEEN ON before! 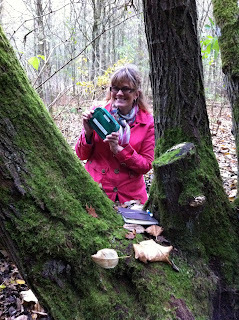 Which is the whole point of Geocaching....it gets you out into the world so you can discover new things along the way! 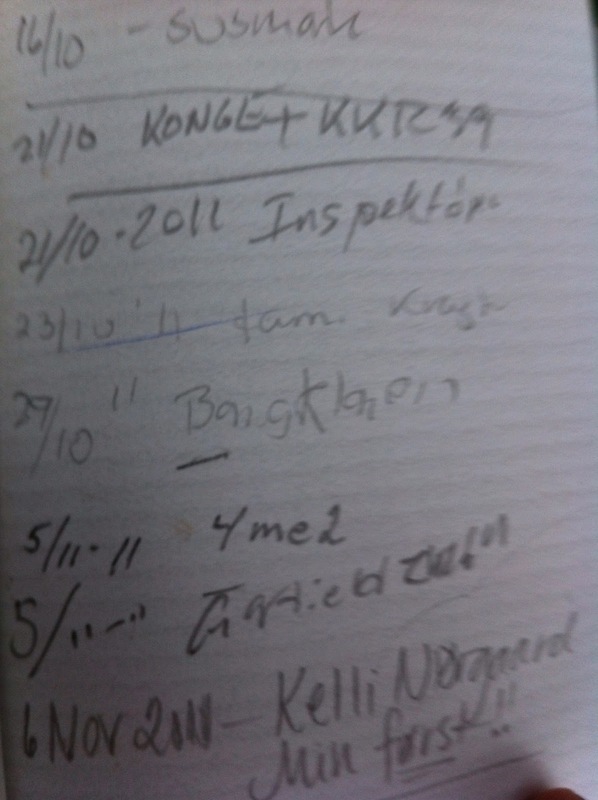 And as you can see from the log book that was with this cache, it is for ALL AGES! What a cool thing for a family to do together!! I leave for Spain tomorrow and am already looking forward to finding a Geocache or 2 while I am there...something to get me off the beaten path, in order to discover something awesome! #1 På Tur i Løvbakkerne may have been my first Geocache, but as Mads has told everyone.... IT WILL NOT BE THE LAST! That is extremely cool! Do they have this all around the world? Will have to check it out if there is anything in Norway. NEAT NEAT NEAT!!! Yes, Amy...ALL OVER the world!! And I am betting that it is even on your island!!! It's so cool. We did this once near a friend's flat in Stockholm. Really must get my act together and do it with the family. A few weeks ago when I was in Myrtle Beach, SC, on vacay, I made one for a friend to find when she and her family are there next summer. So you know your next step will be to make and hide your own! Fun! I want to do this. It sounds like something both Henry and I would love.